She is one of the world's most successful authors and has put the spotlight on Venice in her detective novels. At 75, Donna Leon is still busy plotting her next crimes. The American novelist didn't even have to search for a pen name when she wrote her first detective novel nearly 50 years ago. Her own name, Donna Leon, already sounded like a trademark. Indeed, after publishing 26 novels featuring Venetian detective Commissario Guido Brunetti, her name has become known around the world. Leon turns 75 on September 28, but retirement isn't on her mind. For decades, it didn't seem as if Leon would become a writer. She was born in Montclair, New Jersey in 1942, had a carefree and happy childhood and became a world traveler shortly thereafter. At age 23, she left the US to study in Italy. For 15 years, from 1965 to 1980, she worked as a travel guide in Rome, an advertising editor in London and taught English in schools in Switzerland, Iran, China and Saudi Arabia. "As a young woman, I just wanted to have fun," she said during her current book tour in Germany. However, it certainly wasn't any fun when her dissertation on Jane Austin was lost as she fled the Islamic revolution in 1979. She had worked on the draft for five years. The loss also meant the end of her academic career as a literary scholar. "This was probably the best thing that happened to me in my life," she says in interviews. Venice became Leon's new home. Commissario Brunetti is the leading character in Leon's detective novels. Venice is also home to humble Commissario Guido Brunetti who lives with his wife Paola, a specialist in American literature just like the author, and their two children. Their spacious apartment with a large roof terrace where two canals meet can be found on a city map that comes with the books. "Brunetti is a wonderful character," Leon said in a 2016 interview with German newspaper Die Welt. "He is just as I would like men to be: reserved, responsible, discreet." Leon has been connected to her character since 1992. The idea for her first novel came to the music lover after seeing an opera at Teatro La Fenice, after which she had a conversation with the conductor about the death of star conductor Herbert von Karajan. "I thought that was an interesting way to start a crime scene, and so I thought I'd go ahead and write one." "Death at La Fenice" was her debut novel and became a great success. She has since been able to let her Commissario Brunetti investigate in Venice each year. The crimes are the typical ones one would expect in an overpriced city: corruption, mafia real estate or art trade. In "Death in High Water," the ever-rising flood drives the action. In "Blood from a Stone" a black market merchant is shot right in front of people's eyes in a busy market. But Leon's crimes don't feature extensive bloodshed. The author avoids brutality and carnage. Brunetti tries to understand his perpetrators and victims, their passions, lust for power and money and fear and despair. Leon finds a clear enemy in the Catholic Church, especially in the legends surrounding the Opus Dei institution and its members. For Leon, these groups are on par with the mafia and major corporations. Donna Leon does not want a big celebration for her birthday, but her fans will certainly celebrate the next novel, which will be published in 2018, under the title "Temptation of Forgiveness." Miss Marple is a cranky elderly lady with a sharp wit and a keen interest in gossip. Her character was created by British writer Agatha Christie, who would have turned 125 on September 15. One of the most famous amateur detectives in the world, Miss Marple was featured in numerous hit films in the 1960s. She was portrayed by Margaret Rutherford. He's the prototype of the tough, unerring and yet sentimental detective. With Philip Marlowe, American writer Raymond Chandler (1888-1959) drafted a modern cowboy - a hard-nosed private investigator who stuck to moral principles in the midst of evil and upheld the law. It was Arthur Conan Doyle (1859-1930) who sent the unusual duo off to investigate in England. Theft, blackmail, organized crime, suspicious deaths, and government secrets - there was nothing that could bring analytical thinker Holmes to capitulation. His down-to-earth friend Dr. Watson constantly has to bring him back to a sense of normalcy. The character stems from the pen of Swedish author duo Per Wahlöö (1926-1975) and Maj Sjöwall (*1935). The chief inspector from Stockholm, Martin Beck, investigated crimes in a series of 10 books collectively titled "The Story of a Crime," which were released between 1965 and 1975. The novels were a huge success and have been adapted into numerous movies. Based on his introverted nature and permanent state of mid-life crisis, he could almost be Martin Beck's brother. It was Swedish writer Henning Mankell (*1948) who created Kurt Wallander as a multifaceted detective who struggles with personal hardships like illness, relationship stress and excessive alcohol consumption. As an inspector, he is upright, courageous and authentic. His stomping ground is Venice and it's there that Commissario Guido Brunetti goes about his Sisyphean task of cleansing the world of crime. The cultivated, sensitive officer is only partially successful in his aim: Most of the criminals manage to get away. Brunetti's creator, American writer Donna Leon (*1942), resides in the Italian city. Her novels have been translated into 35 languages. The creation of American writer Elizabeth George (*1942), Lynley and Havers work in Britain. Lynley, the noble criminal investigator, and his proletarian assistant are an unusual duo. In addition to the cases they take on, the private lives of these two characters also play a significant role in George's successful novels. 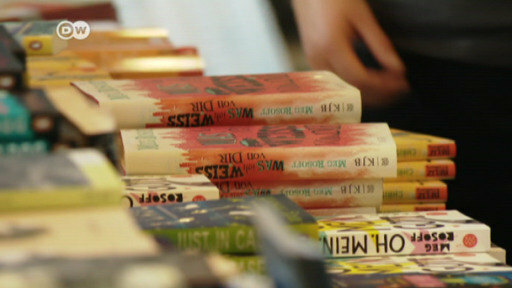 The books were adapted into a television series for the BBC. Novelist Donna Leon has captured the imagination of readers across the globe with her Venice crime novels. She's one of many distinguished guests at the festival. Other guests at the annual event include Wolf Biermann and Arundhati Roy. Many ties link Germany and Romania, and now the Eastern European country is guest of honor at the Leipzig Book Fair. While corruption affects its developing economy, Romania's rich cultural scene offers reasons to hope.